Electrical Safety Specialists offers nationwide infrared services, also known as electrical thermal imaging, in order to ensure your facilities electrical system is operable and compliant with your insurance. The National Fire Protection Association (NFPA) 70B 11.17.5 suggests that every commercial and industrial building in the United States should perform an electrical thermal imaging survey at least once a year. Electrical systems require periodic scanning to ensure optimum efficiency. The experience of the technician is very important. Understanding the thermal imaging equipment as well as having the background to effectively troubleshoot electrical equipment is paramount. Not only are our technicians experienced in thermography, they also have many years of experience in the field as electricians. 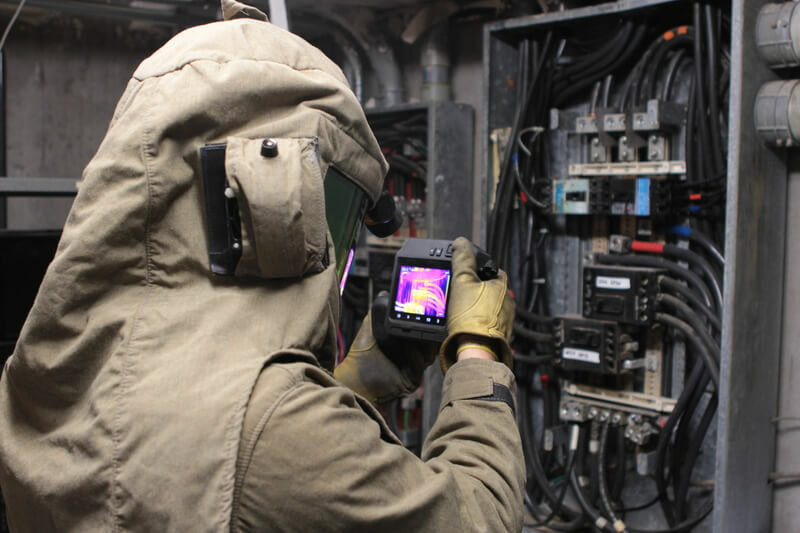 Electrical thermal imaging inspections find hot spots caused by defects in connections and components. Infrared thermography is used to find areas of excess heat (caused by increased resistance) so that problems can be corrected before a component fails, causing damage to the component, creating safety hazards and productivity loss. Because increased heating is a sign of failure, infrared is the best diagnostic tool available for finding these hot connections in the early stages of degeneration. This is why your insurance company may have asked for an electrical infrared inspection, to find and prevent problems before they cause damage to your personnel, equipment and facility. Whether your company is interested in quarterly, annually, or a one-time electrical thermal imaging inspection, Electrical Safety Specialists can provide you with the expertise needed to establish an effective Electrical Infrared Program. Equipment that should be periodically checked? Electrical Safety Specialists is a service-disabled veteran-owned small business. For more information about electrical thermal imaging, call ESS at (816) 925-0443.